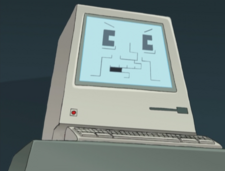 The Computer Judge is an Apple Macintosh computer who is judge on the planet Chapek 9 although he occasionally crashes. On one occasion, he sentenced Fry and Leela to perform tedious calculations and spot weld automobiles. In the same episode, a horn is blown that is the start up sound of the old Apple Macintosh. The sound where he crashes is the same of the Apple Macintosh. Robot Mayor: I intend to demonstrate beyond 0.5% of a doubt that these humans before us are guilty of the crime of being humans. Come to think of, I rest my case. Computer Judge: Thank you prosecutor, I will now consider the evidence. Robot Clerk: Uh oh! He froze up again! Robot Mayor: Try control alt delete. Robot #1: Jiggle the cord. Robot #2: Turn him off and on. Robot #3: Clean the gunk out of the mouse. Robot Clerk: OK OK he's back online. This page was last edited on 16 August 2013, at 21:26.